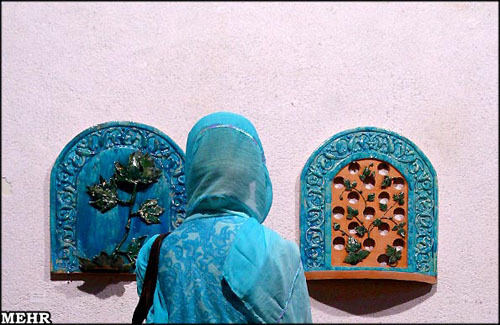 TEHRAN, Sept. 19 (Mehr News Agency) -- Winners of the Iranian women's pottery exhibit held at the Niavaran Cultural Center were announced on Tuesday. They were selected by a jury comprising Farideh Tat'hiri-Moqaddam, Haydeh Sirafi, Marzieh Qarehdaghi, Monir Qanbeigi, and Fakhri Golestan. In the bas-relief section, Rojhaneh Hosseini was awarded first prize. Second and third places were not awarded. In the applied section, Razieh Kian-Nejad won first prize, Maliheh Jalehpur second, and Maryam Shirifard, Nahid Sadeh and Shirin Karimzadeh were jointly awarded third prize. In the sculpture section, Azadeh Shuli won first prize and Sonbol Nafarieh won second prize. In the installation section, Maryam Kuhestani was awarded first prize and Sussan Khataii second prize. Four pottery researchers Jila Kamyab, Soheila Kazemi, Somayyeh Shah-Hosseini, and Zahra Mohammad-Ganji were also honored in the research section. Head of the Niavaran Cultural Center Asgahr Mehr-Aiin, secretary of the exhibit Manijeh Armin and member of the policy-making council of the event Eshrat Sirus were present at the prize-giving ceremony. Cosponsored by the Ministry of Culture and Islamic Guidance, Tehran's Museum of Contemporary Art, and the Cultural Heritage, Tourism, and Handicrafts Organization, the event was held from September 9 until 18.